One of the greatest things about Sage 200 is the level of control it gives you. 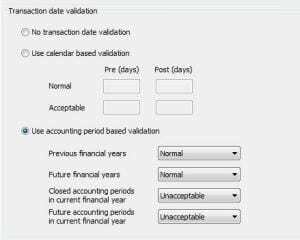 An example of this would be the ability to validate transactions based on the date they are entered. Done using a pre-defined range based on the current date, this reduces the possibility of transactions being posted to incorrect dates. To enable this feature, go into: Accounting System Manager –> Settings –> System Settings and select the second tab along the top Transaction Settings. From here you will see that there are three options of transaction validation. This is the default when Sage is installed. Options 2 and 3 are both enabled versions of the validation. 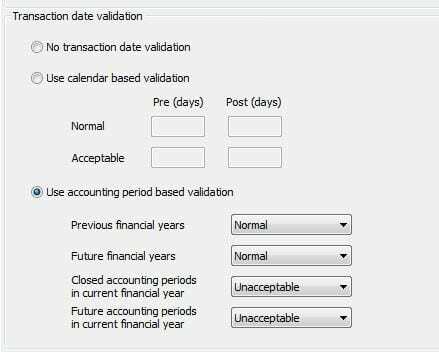 By selecting this option, you are choosing to validate the transaction date plus or minus a set number of days. By setting this type of validation it is possible to prevent transactions being entered in an incorrect financial year. Being able to select the outcome based on period control offers great flexibility with regards to validation. You may wish to accept transactions for any current financial year date, but prevent dates in previous or future financial years. You could accept transactions only for closed periods and previous financial years, but not for future periods or financial years. This may be useful when going through the process of entering opening/closing balances. Normal – These can be posted without noticing a difference in the transaction entry screen. Acceptable – This option highlights the date in Yellow to warn you of the date that you are entering. Unacceptable- This option will highlight the Date in red and will not allow you to enter the transaction.